« Lincoln Highway in "Endless streams and forests"
Illinois Lincoln Highway Coalition has installed the next in the series of Interpretive Murals along the 179-mile Illinois byway corridor. The mural on a township building at 11008 West Lincoln Highway/US 30 in Frankfort, Illinois, depicts the actual Eagle Scouts and Scout leaders who made a Nationwide Safety Tour along the Lincoln Highway in 1928. 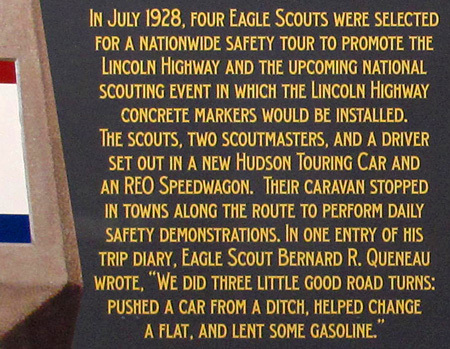 The tour was a promotion of the Lincoln Highway and the Scouts’ plan to place concrete markers along the route. The story of their adventure giving safety daily demonstrations, “good road turns,” and helping out wherever needed is told in the mural. Specifically named is Eagle Scout Bernie Queneau, now age 99 and still one of the Lincoln Highway’s leading supporters. For information on the Lincoln Highway in Illinois, including places to see, stories of the highway’s significance, or to download an Illinois Lincoln Highway Visitor Guide, visit drivelincolnhighway.com/. This entry was posted on December 14, 2011 at 4:25 pm and is filed under highways, history, Lincoln Highway, roadside, signs, travel. You can follow any responses to this entry through the RSS 2.0 feed. You can leave a response, or trackback from your own site.